We're happy to offer our DC readers the chance to attend a free advance screening of Professor Marston & the Wonder Women. The film stars Luke Evans, Rebecca Hall, and Bella Heathcote in the incredible, unusual story of Wonder Woman's origin! SYNOPSIS: In a superhero origin tale unlike any other, the film is the incredible true story of what inspired Harvard psychologist Dr. William Moulton Marston to create the iconic Wonder Woman character in the 1940's. While Marston's feminist superhero was criticized by censors for her 'sexual perversity’, he was keeping a secret that could have destroyed him. Marston’s muses for the Wonder Woman character were his wife Elizabeth Marston and their lover Olive Byrne, two empowered women who defied convention: working with Marston on human behavior research -- while building a hidden life with him that rivaled the greatest of superhero disguises. The screening takes place tomorrow, Tuesday October 10th at 7:00pm at Regal Majestic in Silver Spring. If you'd like to attend, simply go to the Annapurna Pictures screening site here and download one pass good for you and a guest. Please note that all screenings are first come first served, and you will still need to arrive early to ensure receiving a seat. Enjoy the show! 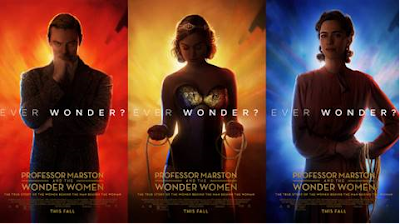 Professor Marston & the Wonder Women opens October 13th.